Yes, i’m well aware the trade transpired on 27th of Oct. Trades are often talked about for a few days or possibly a week, and trading away a captain, even one that was briefly held and a prolific goal scorer, deserves to be addressed and re-addressed. This is the first re-addressment of the trade. The next will be whether the Sabres are able to re-sign Moulson (as they ought to). Back when Buffalo was the worst team, still are, in the league, the Sabres traded a star and fan favorite in Vanek for someone not seen to be as good as him in the Islanders’ Moulson along with a a 1st rd pick in 2014 and a 2nd rd pick in 2015. At the time of the trade bewilderment beset both fans of Buffalo and players alike. Rumors were abound on what player was next to go. Not if but when the next star (Miller) was going to leave. The Vanek/Moulson trade had a big impact on not two but three different teams. Buffalo, a team in rebuilding mode sent their star and packing for seemingly his shadow. This left Buffalonians fearful of a full rebuilding mode. Buffalo was already rebuilding. They just gave Myers a hefty paycheck a couple years ago. They acquired Ehrhoff to compliment Myers. They bolstered their ‘toughness’ with Scott and Kaleta. Let us not forget this trade, these prospects, and even the firing of Ruff for a change in guards and brining in Rolston from AHL affiliate Amerks. Buffalo was already rebuilding and transitioning from one style to another, much like the coronation of Pope Benedict XVI. As I see it Buffalo is searching for versatility. The trade, a bold but necessary move really positions Buffalo to be a potential playoff bound team in the 2014-2015 season. 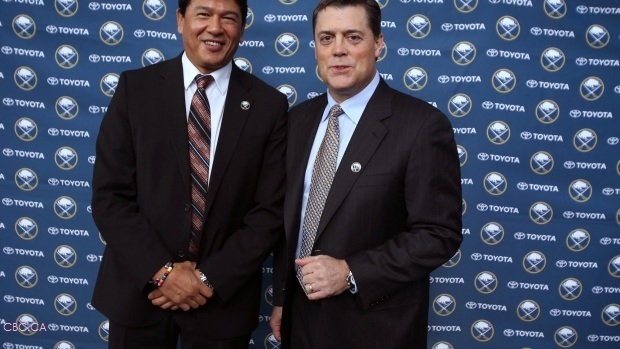 Acquiring LaFontaine and Ted Nolan (who coached Buffalo from 1995-1997) were important steps in completing a fast rebuild of the Buffalo Sabres. 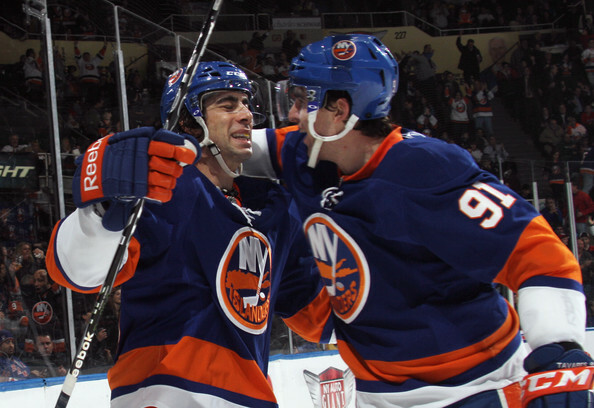 Moulson will be able to grow with the core group of young players as well as provide experience to lead. Ott really isn’t a ‘C’ type player (no offense). As for the other team in the trade, the Islanders are now a guaranteed desperate playoff-bound team. 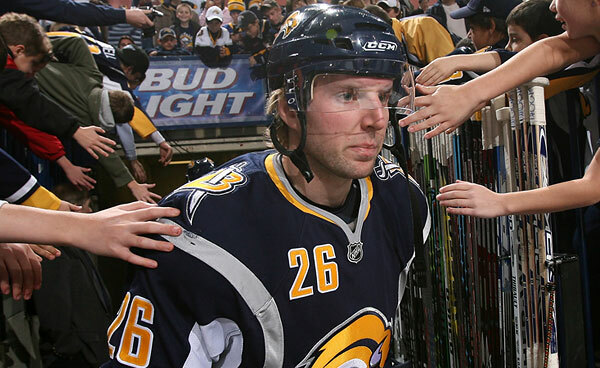 Acquiring a star like Vanek this early in the year grants them plenty of time to learn and bond with his teammates. [stats: 4G, 5A, +5 with Islanders in 12 games]. While 9 points in 12 games is a good ratio much more was expected of both Vanek and the Islanders. The Islanders are 4-13 with Vanek on the roster compared to 4-7 without him (OT were counted as either losses or wins). All he has netted the Islanders are six extra losses and the loss of a probable excellent first round pick. The Islanders are not living up to the expectations of many and may have issues behind the scenes (an excellent read). Either Vanek has yet to get used to his new team or Vanek was the brightest star in a sky with little light. Buffalo has undergone other changes to improve themselves. Kaleta was reassigned to the Amerks where he’ll surely never see the light of day in the NHL again, or at least in Buffalo. They have also sent down Ristolainen and Grigorenko (bold but very smart moves as neither should be on their team) and recalled Luke Adam, Alexander Sulzer, and Brayden McNabb. Additionally they also claimed Matt D’Agostini off waivers from Pittsburgh. As someone who adores his Penguins take it from me that acquiring D’Agostini is a sound tactical play for Buffalo. He is and will develop to be a solid RW, bounce between 2nd and 3rd line. Additionally he will assert defensive duties to allow his teammates to jump into offense. He will also go for pucks in the corner and chip in offensively as needed. He’s a smart hockey player with good vision and all-around good play. Buffalo, being loaded with so many offensive minded players (including D-men) desire a few good all-around good players. What Buffalo can’t do is trade away Miller. The Sabres may be rebuilding but it only has to be a rebuild for this season, a fast rebuild. 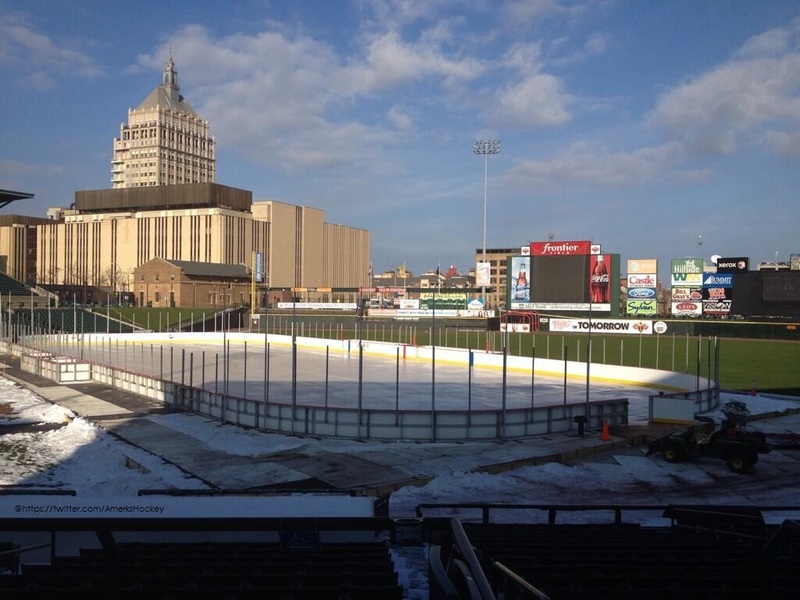 With Grigorenko now in the AHL (and Jr World Championship and Ristolainen with the Amerks as well i’ll be able to evaluate their play and potential better sitting in the stands of the War Memorial as well as freezing outside at Frozen Frontier. At least i’ll have Ristolainen and Gauthier-Leduc’s good looks to keep me warm as I tweet at the game next Friday! This entry was posted in Buffalo Sabres, NY Islanders and tagged Bewilderment, Christian Ehrhoff, Frontier Field, Lindy Ruff, Matt Moulson, Pat LaFontaine, Patrick Kaleta, Rochester Amerks, Ryan Miller, Thomas Vaneck; Matt Moulson. Bookmark the permalink. You won’t be the only one there from Puck Buddys freezing their tail feathers off at that game, I will be live tweeting the whole thing from a Monsters perspective. Awesome! I have an extra ticket if you need it or want to bring anyone with you. It is in section 101.